These booties have been sharply discounted because the white woven ribbon looks slightly gray against the off white cotton knit. With this substantial discount, please understand that these are final sale. 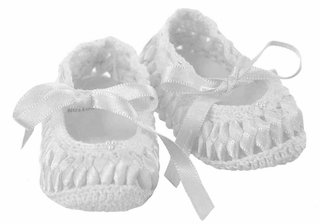 These are the cutest little white cotton hand knit booties! 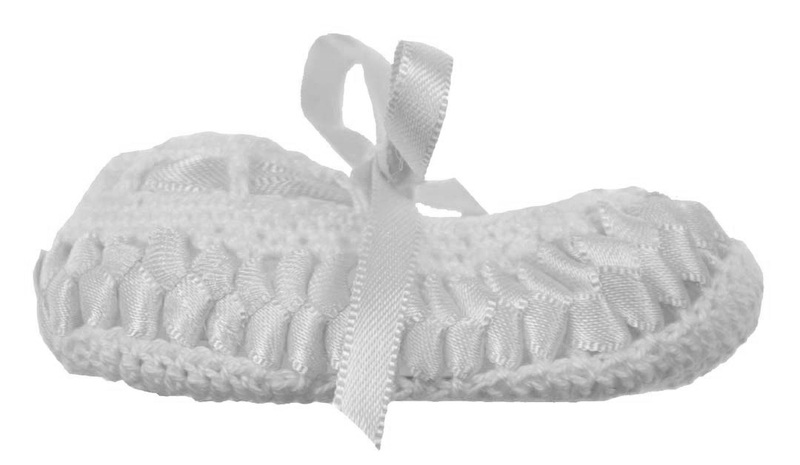 Made in vintage style with white woven ribbon around the sides, they feature white knit trim with three tiny seed pearls. White ribbon insertion at the top ties in a bow. Perfect for a baby shower gift or a newborn baby gift. These darling booties are also available in ivory and white with pink. Similar styles are available for baby boys. See below. 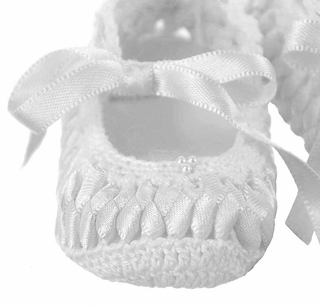 Grammie's Attic has a wonderful collection of new and vintage baby booties, including beautiful embroidered christening booties, elegant silk crocheted booties, toasty warm hand knitted booties, adorable vintage open toe booties, and many more. These sweet little booties are perfect for baby's christening, baby shower gift, newborn baby gift, or just the right accessory for baby's special outfit. Be sure to see all of our darling baby booties!